Stage 2. Body Tub & Stage 3. Repairing the Body Tub. Stage 4. Fitting the Tub to the Frame. Stage 5. Changing the Steering System. Last updated, 06/04/01 Several photo's added to Stage 5 showing steering brackets and additional parts for sale added. Welcome to my online photo album. The following photo's walk you through my project and lead you from starting with two non-running cars to the completed car you see in the first photo. I hope you find my project interesting and useful and that you learn from a few mistakes I made. I found and posted an early scanned photo of how the car looked back in September of 97. "Located at the bottom of this webpage." 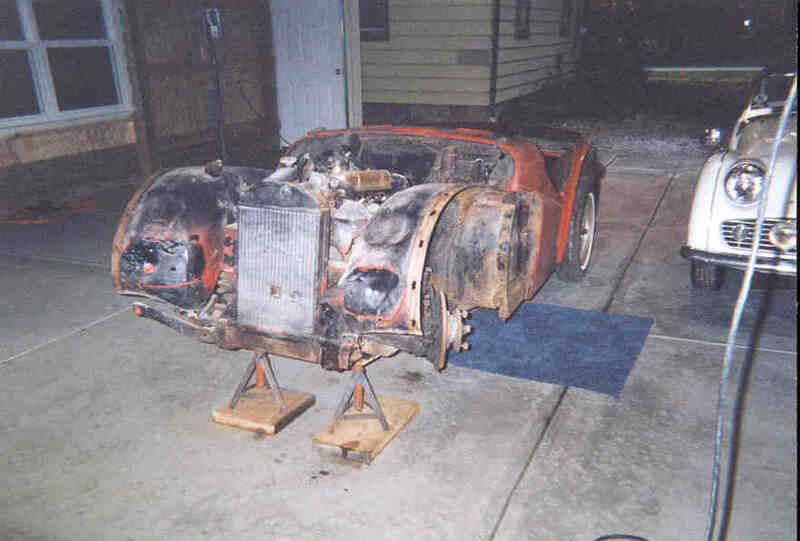 My project started in September 1997 with what looked like a complete car. The idea being to build a car that could be used every day, without the usual problems associated with the technology of the 1950's. I soon found I needed a second parts car. I located one twenty miles from home which some kind person had completely dis-assembled labeled and boxed for me many years before. It even came with four new unmounted tires. After a few weeks and having removed the panels from the original car I could then see what I had to work with! If there's one thing I found out over this project it was to split the project into sections and do a small part of it, finish it and then move on.